In one of his films Woody Allen is asked who he’d be if reincarnated. He decides on Warren Beatty’s fingers. 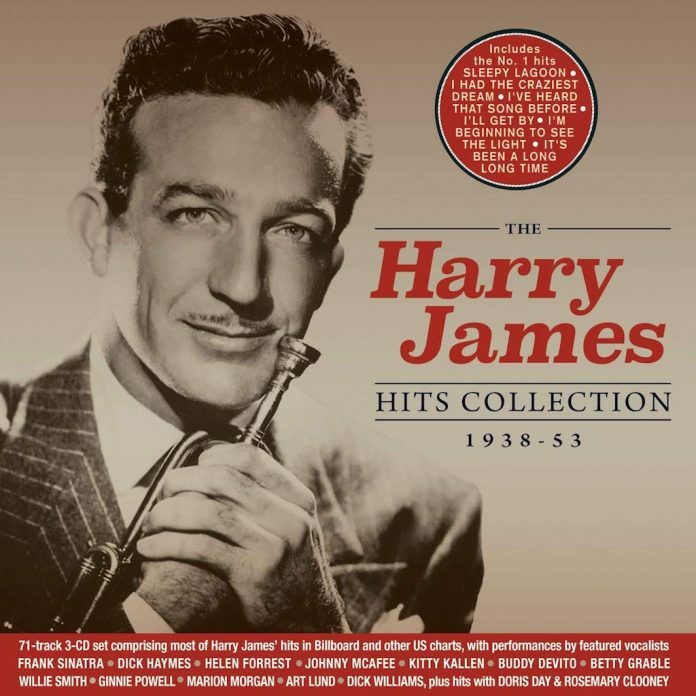 If metempsychosis doesn’t allow me to be a peregrine or merlin, I’d quite like a shot as Harry James’s lips. And not just for the more obvious reasons. You could hardly put together a more joyous and charismatic package of material than this. The 1941 “Trumpet Rhapsody” always makes me smile, though I have a special affection for the tracks made the following year, now under the shadow of war, with Helen Forrest. James was a regular presence in the hit parade at this time, though as far as I know only “Sleepy Lagoon”, one of his wetter (so to speak) numbers, “I’ve Heard That Song Before”, “I Had the Craziest Dream” and “I’ll Get By” won the top spot, at least until late in the war and the comparatively dull “I’m Beginning to See the Light”. “I Don’t Want to Walk Without You” (from Sweater Girl) and “Mister Five by Five” (both of them with Forrest) were both beaten to number one, as were a couple of others, this despite the fact that Harry was widely considered to be God’s Gift, to music as well as to women. He took a dim view of any suggestion that he played to the commercial middle, always insisting that jazz was at the centre of everything he put out. It’s hard to argue with that here. The facility of his tone never disguises the intricacy and thoughtfulness of everything he played, even if the attention was directed to the singer. Of those who worked with him at the time, Frank Sinatra was to be the most prominent in later life. Harry wanted him to go out as “Frankie Satin”, but was turned down, apparently quite robustly. James regarded singers as a necessary evil, but with the emphasis on necessity. Frank sings on “Ciribiribin”, which in some ways is the archetypal James track, sentimental and courageous by turns, delivered with a technique so outrageously honed you forget the amount of work that went into it. No coincidence that he came out of a family of circus performers: no one walks the line between schmaltz and real danger quite so confidently as circus folk. There are lots of James compilations out there. You can wade through the Classics reissues one by one, if you have the patience and don’t mind the impression of tinnitus. There’s a good Columbia set of the Sinatra material on Columbia, with cleaner sound. I enjoyed these enormously, and found nothing to complain about. James (t) and Orchestra, plus singers as listed above. "I enjoyed these enormously, and found nothing to complain about".